You make the teacher’s life easier. You try to play nicely with the teacher, and stick to the school rules. You attend meet-the-teachers conferences and budget meetings, but you don’t come looking for a fight. When your child is at fault, you listen to the whole story and try to prevent any problem from recurring. If it’s autumn theme week, you send a bag of dry leaves. Pros: The teacher knows she can rely on you to provide support at home for what she’s trying to do in the classroom. 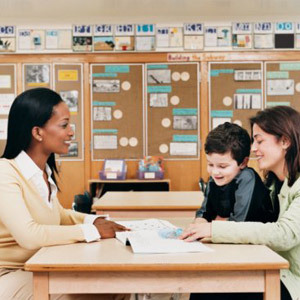 You and your child feel secure knowing that you believe in the teacher’s efforts. You are interested in listening and communicating. Cons: You may tend to become a little too chummy with the teacher, and struggle to cope if she ever leaves. Action: Keep on doing as you are, it’s parents like you who give teachers the space to do what they do best. Not quite right? Go back and find another profile that’s more appropriate. What does the teacher think of you? Confess in the comment box below.